A lot can change in a year. Last December, we had a different name (Read It Later), and the service, founded in 2007, had welcomed its 4 millionth user. A year later, we’ve settled in with our new name (Pocket! ), we have a community that has nearly doubled in size—and as the chart below demonstrates, activity has taken off, inside Pocket and across our developer community. All told, you “saved to Pocket” 240 million times from January through December, more than the prior four years combined. Your most-saved article this year? “Obama’s Way,” Michael Lewis’s 13,000-word presidential portrait for Vanity Fair. 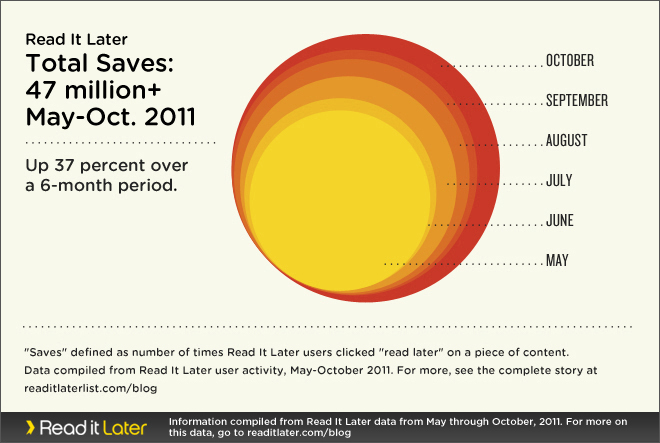 Its popularity demonstrated the power of save-for-later when it comes to empowering people to embrace longform reading. In fact, 80 percent of all “opens” in Pocket happened after the story’s initial four-day rush of popularity—and for every one person who read “Obama’s Way” in Pocket, they introduced the article to an average of 1.4 others outside of Pocket. The most-saved video in Pocket was (surprise!) PSY’s “Gangnam Style.” The music video remained within 50% of its peak popularity in Pocket for a whopping 58 days, and the graphic below shows that it truly was a viral phenomenon. The video didn’t even peak in Pocket until 70 days after it was first posted. As the holidays approach, we just wanted to say thank you for an incredible year. You helped turn Pocket into a chart-topping (and award-winning) app for iPhone, iPad, Android and Mac, and your feedback has helped us make Pocket a simple, enjoyable way to save and view the content that matters to you. Here’s one more data point we’re really proud of: Pocket released more than 40 updates this year across iOS, Android, Mac and beyond. We’re excited for what’s next in 2013. Happy holidays from the entire Pocket team. As the Ireland-based editor for the U.S.-based site Mediagazer, Lyra saves her content later in the evening, matching up with the Eastern and Pacific time zones. 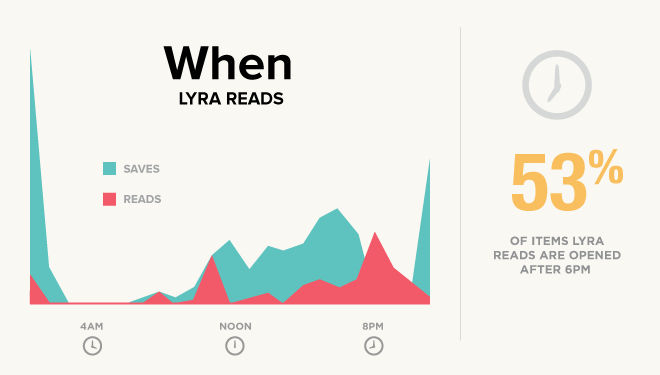 And more than half of Lyra’s reading occurs after 6 p.m. Belfast time. What kinds of content are you saving right now? What apps do you use for reading in Pocket? “The New York Times does some of the best investigative journalism in the world. They really get what makes a good story, and their journalists have a talent for spotting hidden gems beyond what everyone is talking about on Twitter. I’m surprised Wired isn’t on this list but having said that, I read a lot of stories via my RSS feed. I religiously read Wired’s Danger Room blog and Jeremy Scahill over at The Nation. How does Pocket help you with your journalism work? But here’s another fact about our more than 4 million users: They also love video. As video consumption has exploded on the web, and as content has become more multimedia-rich, we realized early on that our users weren’t just saving articles to read—they were saving their favorite video clips from YouTube, Vimeo, and beyond. Even the articles weren’t just text anymore—they’re a mix of writing, images and embedded video. To meet this demand, Read It Later quietly began supporting in-app video streaming in 2010. 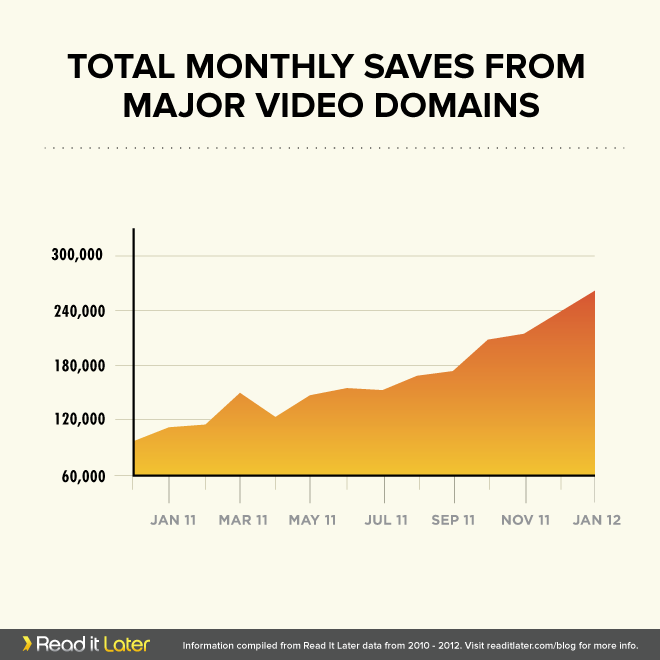 In the past year alone, video saves using Read It Later have grown by 138 percent, and YouTube is now the No. 1 most-saved domain in all of Read It Later. We’re also seeing new evidence that our app is helping people consume longer video than what’s been traditionally embraced on the web: In an analysis of Read It Later’s top 1,000 saved videos, the median length was nearly 30 minutes. We mentioned YouTube is No. 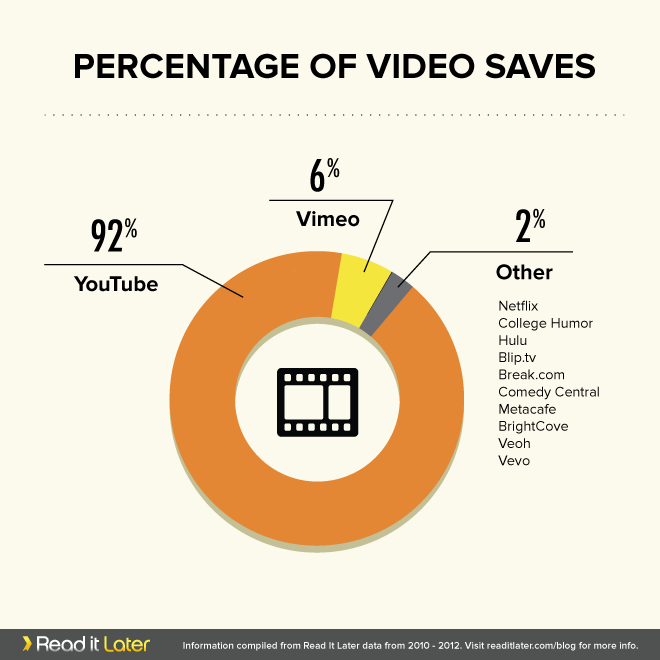 1, but here are the other video sites and what percentage of total saves they have. It’s important to note that Read It Later currently only offers optimized viewing for YouTube and Vimeo, so this likely has an effect on how the other sites stack up. In the meantime, we’re working hard to expand our support for all the video sites you like to use. It’s been widely accepted that video on the web should “keep it short,” but that might be changing in a time-shifted world. When we looked at the 1,000 most popular videos from July through December, 32 percent of the Top 1,000 videos were over 5 minutes long, and the median length was 29 min., 33 seconds. So, in an era of TED Talks, Khan Academy and university courses, we’re seeing evidence that users will embrace longform video if given the tools to do so in a way that fits with their daily lives. Of course, with 68 percent of videos saved under 5 minutes, short-form still rules: As our Most-Saved Videos list shows (see below), users love to save everything from music videos to animation, movie trailers, news clips and more. Shorter clips also represent the vast majority of video content produced for the web. No matter what you prefer, Read It Later is committed to making it easier for you to consume all your favorite content, whether it’s through a beautiful reading experience or the ability to watch video seamlessly. And we’ll continue working to help users enjoy it anywhere, on any device. 5. “The Joy of Books” (1:51): Stop-motion animated film of what happens inside a bookstore at night. A lot of happy people unwrapped new gadgets this holiday: Device registrations for Read It Later jumped 148 percent from November to December—a bounce for all the devices and platforms we support, including the iPhone and iPad, Android, Kindle Fire and Firefox extension. Which device saw the biggest jump? This holiday it was the Kindle Fire—12.5% of all devices registered on Christmas day and an impressive 17% of new users on the day after Christmas were from the new Amazon device. As you can see below, the Kindle Fire is still quite a bit smaller than our Android and iPhone/iPad audiences (it’s also the only platform with no free version yet). As we recently discussed with Om Malik, it will be interesting to see how that adoption grows over time. We also saw some interesting data from the Android platform this holiday. 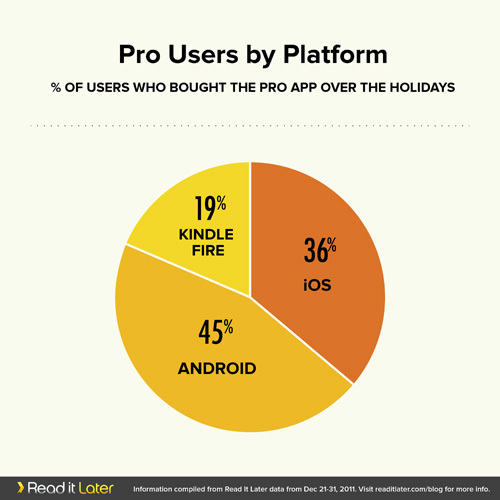 While some have claimed that Android users aren’t interested in paid or premium apps, 45% of Read It Later’s Pro users during the holidays came from Android, and 19% came from the Kindle Fire. 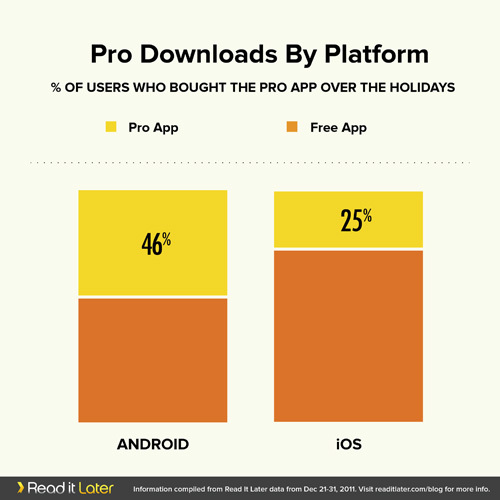 Of Read It Later’s Android users who registered their device during this period, 46% opted for the Pro version during this period, compared to 25% of the iOS user base going Pro. 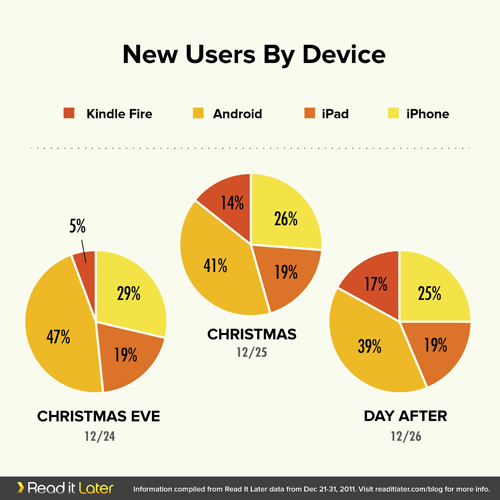 Our holiday data serves as another nice reminder that Read It Later users own many different devices—and their preferences for these devices can change over the months and years. They should be able to access their content wherever they are, or whatever they own, and our goal is to offer the broadest support possible—no matter what you unwrap next year. 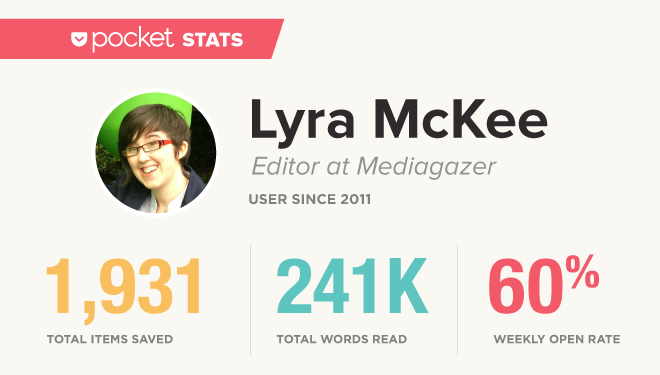 The response to our report last week on the “most-read authors” in Read It Later was incredible. One thing is clear: We can learn a lot about the value of great content, outstanding writing and what resonates with people by paying close attention to who’s creating it, and how readers are consuming it. We’re now at 4 million readers and viewers—the largest time-shifting platform on the web—and we feel a responsibility to show how content accessibility can change the way we enjoy what’s out there. Some notes from last week’s coverage: The New York Times’ David Carr and others reported on our “most-saved” authors, as well as the new concept of “return rates.” That is: It’s not just which authors our users saved, but which authors they returned to. That can say a lot about loyalty to a byline, and the longevity of what they create. It’s important to add that our data reflected only the most-saved and ‘most-read’ authors—not the most-saved publishers. As you’ll see soon, Read It Later’s most-saved publisher list is quite different than who ranked highest on our author lists. For example: While Lifehacker’s individual authors were top-ranked on our most-saved authors list, The New York Times is five times more popular overall as a publisher. One reason has a lot to do with the sizes of various publications’ editorial staffs. The New York Times has hundreds of writers, so their engagement is spread across many different bylines. Gawker Media properties all did extremely well in the most-read authors report, and there were some fascinating examinations of why Lifehacker ranked atop the “most-saved authors” list, while Deadspin ranked at the top for “highest author return rate.” But why did Gawker Media do so well? Again, look at the Gawker Media mastheads. Small staffs, high volume of traffic. The New York Observer’s Foster Kamer also noted some interesting similarities among the writers with the highest return rates—they all have strong, very distinct voices, which suggests a loyalty to the individual writer that we’ve always guessed was true, but could never quite quantify. Kamer also had a very funny take suggesting all those Lifehacker people saving their to-do lists were not actually getting around to crossing anything off their lists. 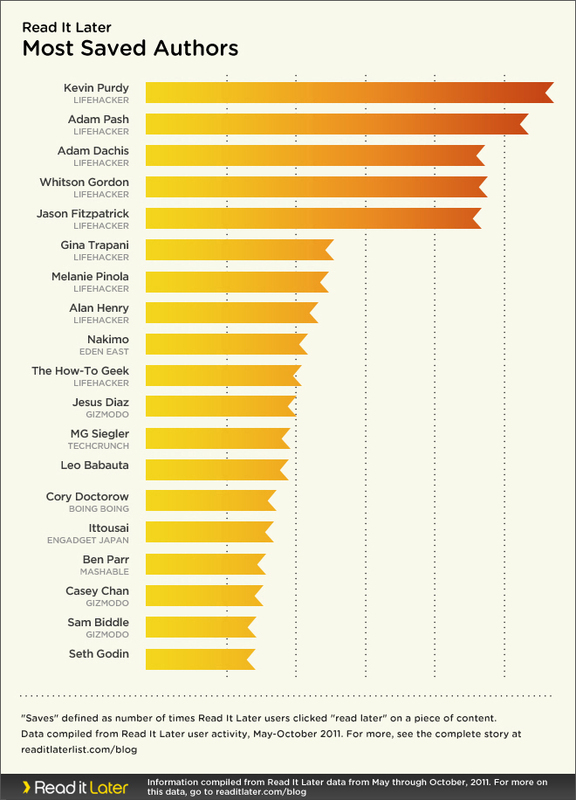 But actually, most Lifehacker authors had above-average return rates. 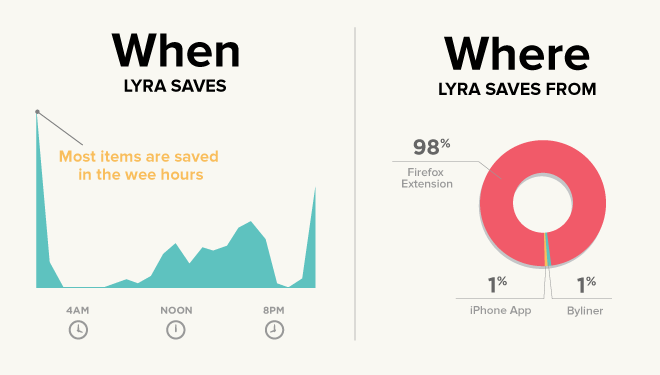 So maybe our users are pretty productive, after all. Finally, Nieman Lab’s Megan Garber had a sharp take on what engagement looks like in a time-shifted world, and we think this underscores what’s so interesting and important about “Return Rates” as a way to judge depth, longevity and loyalty to an author, publisher or topic. 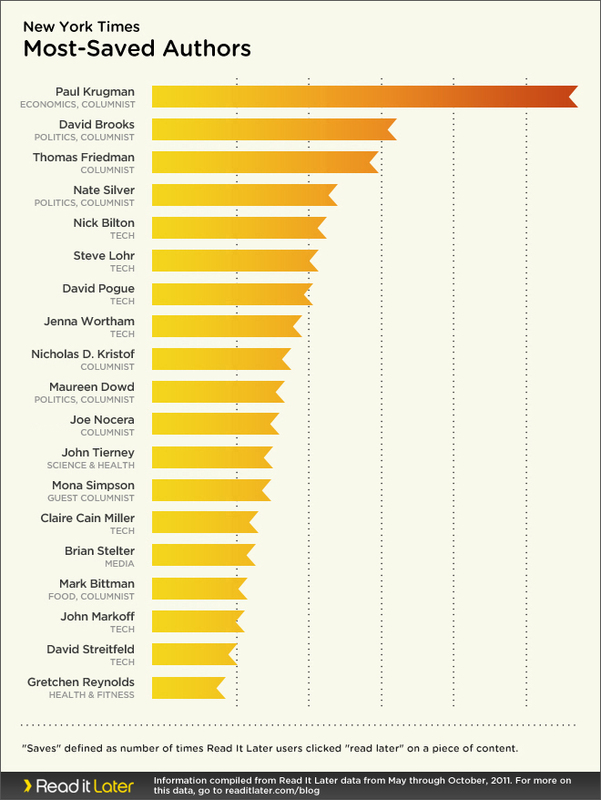 Many of our highest-return rate authors came from the category of sports, TV, and politics. But there’s a lot more to explore in terms of how those categories resonate in terms of reader loyalty. More than anything, we hoped last week’s report would start a whole new conversation about how we measure the quality of what’s on the web: After all, it’s the content, created by writers, editors, producers and publishers, that make people so passionate about time-shifting. Through transparency we at Read It Later hope to give them more insight into how their work is enjoyed. We will continue to share what we know with our users. Who Are the ‘Most-Read’ Authors? If we’re to believe Woody Allen, “80 percent of success is showing up.” It takes more than just a great idea: you also need the drive and luck to be in a place where it can be recognized. Allen is a writer (among other things), so one might wonder if his 80-percent rule applies to writing as well. How much of a writer’s success can be attributed to showing up in the right place at the right time—whether it’s on the front table at Barnes & Noble, the top of the New York Times bestseller list, the first page of Google search rankings, or the top of a person’s Facebook news feed? And then: What happens after they show up? Read It Later has a unique dataset to explore these kinds of questions. Nearly Over 4 million users rely on Read It Later when they click the “read later” in their browser, tablet or smartphone—and they come back to our app to dig deeper into the stories they’ve saved, recipes they’ve discovered, or videos their friends have recommended. That means Read It Later users aren’t just drive-by visitors to a piece of content—they’re passionate about it. The content is important enough that they added it to their queue so they wouldn’t miss it. Earlier this year, our founder Nate Weiner offered a revealing look at how “time-shifting” online content has changed our reading behavior. 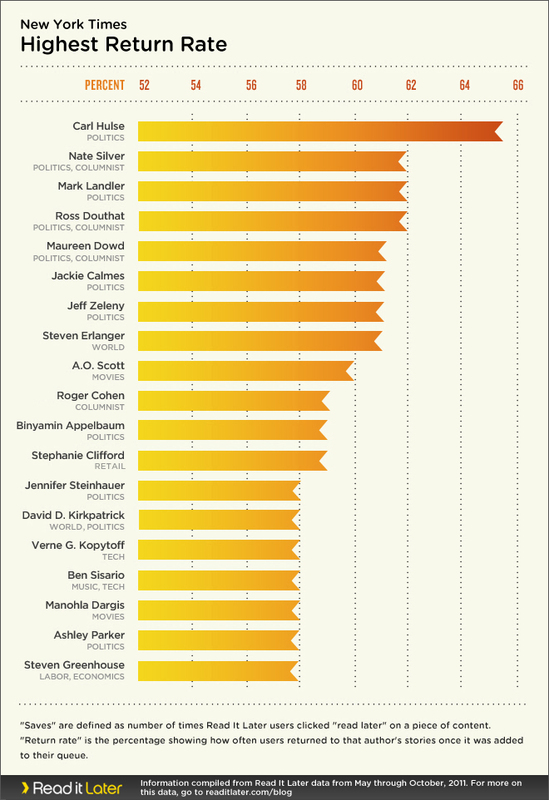 Here, we take a closer look at the most-read authors on the web. First, a quick note on the data: We take user privacy very seriously, and all data is anonymized and scrubbed of any identifying information before it is analyzed by our team. For this piece, we examined stories that were saved over a six-month period from May 1 to October 31, 2011. If you see any issues with what we’ve presented here, or have suggestions on what else we could investigate, please drop us a line: trends@readitlater.com. So… Who Are the ‘Most-Read’ Authors on the Web? Back to Woody Allen and that remaining 20 percent: Once a reader shows up, does it matter if anyone actually reads what someone has written? Sometimes it seems like what gets read is an afterthought. But often, it’s just too difficult to know what a reader does with a story after they’ve clicked through on the web, or purchased it in a bookstore. We examined two things: How often our users clicked “read later” on an author’s story, and how often they returned to that story in some fashion. 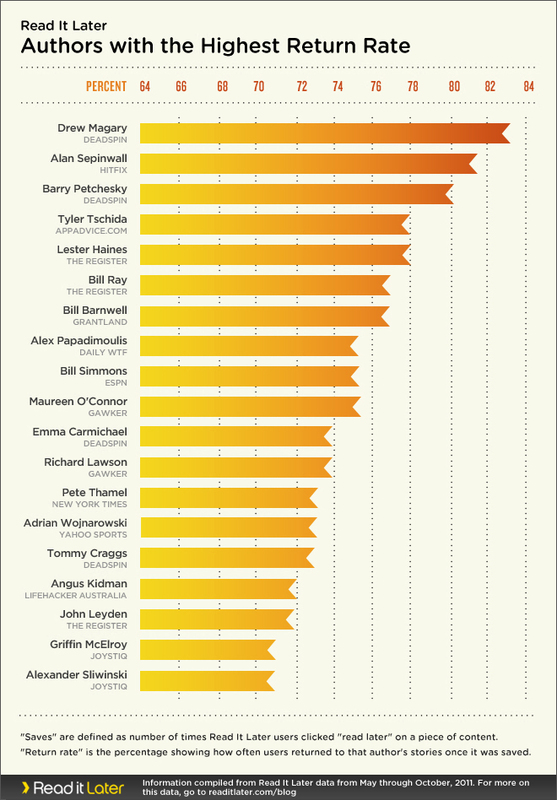 Who were the most popular writers during this period? A quick glance shows that our readership is highly practical…and (surprise) big on technology. Nine of the Top 10 most-saved authors inside Read It Later are writers for Lifehacker, the must-read blog for lifestyle design. This makes sense, given the useful, evergreen content their team produces every day—it’s a natural for how-to and instructional content that readers might find and want to come back to. Kevin Purdy, Adam Pash, Gina Trapani and the rest lead Read It Later’s most-saved list, followed by a who’s-who of tech blogging—including Jesus Diaz of Gizmodo and MG Siegler of TechCrunch—and big-name writers like Cory Doctorow of Boing Boing and bestselling author Seth Godin. Read It Later users are also an international bunch: Japanese tech writers like Engadget’s Ittousai also made the most-saved list. While pure popularity is great, we also want to know more about other factors that make content valuable—like longevity and loyalty. It’s not just about how many people clicked the first time—it’s about whether they also came back again. 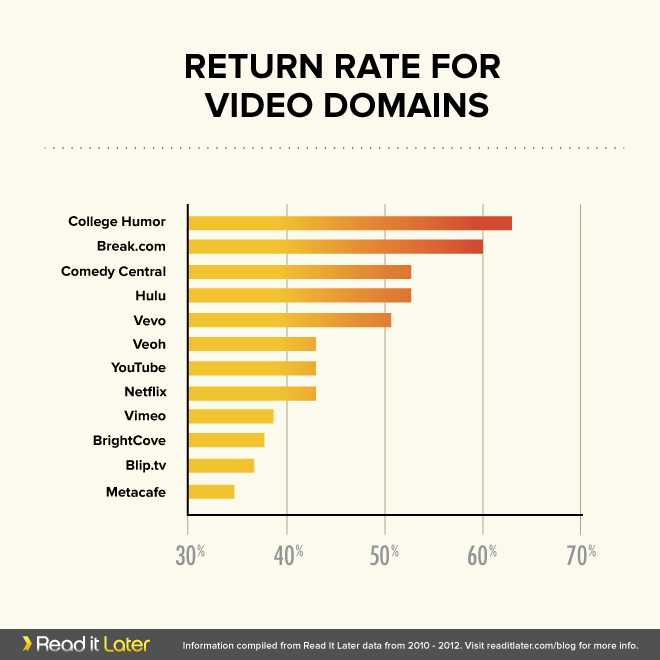 The most interesting thing isn’t just that we found different authors for the top “return rate,” but also different categories of content and types of publishers. Top saves were focused on how-to and tech content (a likely side effect of our largest user group being early tech adopters—because, hey, even at 4 million users, we’re still ‘early’), but the authors with the strongest reader loyalty included writing about sports, general news and gaming. The magic of Drew Magary. One constant across both charts: Nick Denton’s Gawker Media properties (Lifehacker, Gizmodo, Deadspin, Gawker) are among the most popular any way you cut it. Daily bloggers are well-represented in the above data, but we also get this question from publishers quite a bit: “How does long-form content perform?” After all, with time-shifting and mobile devices, couch reading has never been better. For this question, we took a different approach: The above charts are based on pure volume of articles saved, so that rewards the most prolific bloggers and tends to under-recognize those writers who publish longer pieces less often. But that doesn’t mean they are “showing up” any less. Those who channel their energy into fewer, but longer posts, can see the same great payoff. Let’s compare six very different writers (all of whom we enjoy reading): TechCrunch blogger Alexia Tsotsis, ESPN’s Grantland writers Chuck Klosterman and Tom Bissell, Rolling Stone and New York Magazine writer Vanessa Grigoriadis, and New York Times reporters Jeffrey Gettleman and Susanne Craig. This comparison can be apples-to-oranges: For instance, Alexia’s work is shorter, and there’s a possibility that she’s more likely to be read immediately. But what we’re seeing is an important new way to judge the quality of content, from the standpoint of loyalty to an author and longevity (or long-term usefulness) of their content. Top Times saves: The list includes a cameo from writer Mona Simpson (who was featured for her heartbreaking eulogy for brother Steve Jobs). Name-brand columnists, tech, politics and media are the big winners here. Columnist and economist Paul Krugman was the most-saved writer at the Times from May through October, followed by his Op-Ed columnist colleagues David Brooks and Thomas Friedman. The next most-saved came from the Times’ blogs: FiveThirtyEight data geek Nate Silver, then four Times tech writers: Nick Bilton, Steve Lohr, David Pogue and Jenna Wortham. Do the names change when we look at the highest return rates for the Times? There’s a lot of debate right now on the web about quantity versus quality—tracking quantity has always been easier than understanding the power of quality. We think there’s an important conversation to be had about how we use metrics like longevity and loyalty to better understand what’s important to readers. Bloggers, long-form writers and how-to columnists all bring unique value to what they publish. They can operate on a different metabolism, so what’s important is whether readers keep showing up to enjoy your work, whatever form it takes. 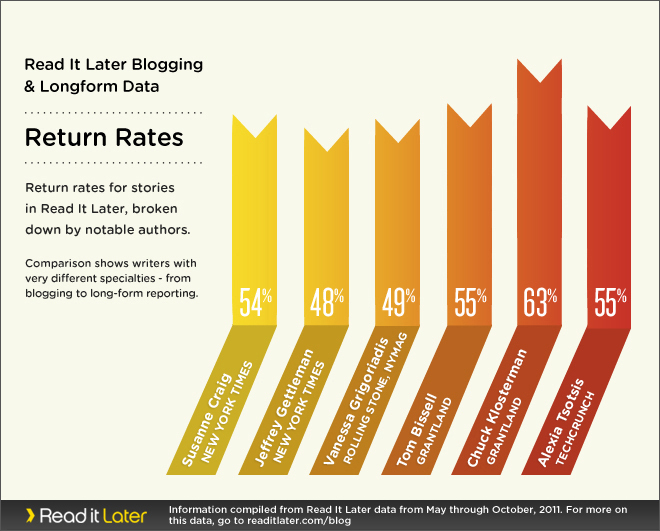 Woody Allen, by the way, had a 42 percent return rate for his stories in Read It Later. I wonder how his films do? Next: Get a sneak peek at Read It Later 3.0, coming soon for iPhone/iPad, Android and Kindle Fire. Is Mobile Affecting When We Read? Printed media used to allow us to read in the places we found most comfortable. When you imagine yourself reading the newspaper it’s probably in your favorite chair, at the breakfast table, or at the cafe with an orange mocha frappuccino in your hand. Unfortunately, as news and media moves online, it moves us away from these places and into our desk chairs. Even worse, consuming content is no longer on our own schedule. The flood of content disrupts us all day as if we have an maniacal paperboy throwing new editions on our doorstep every 15 seconds. However, after studying Read It Later’s own data, it seems that this trend is being reversed. I’ve found that as devices become more mobile, it’s not only changing where we read, but when. Today, I’d like to show you some of the data behind this movement. 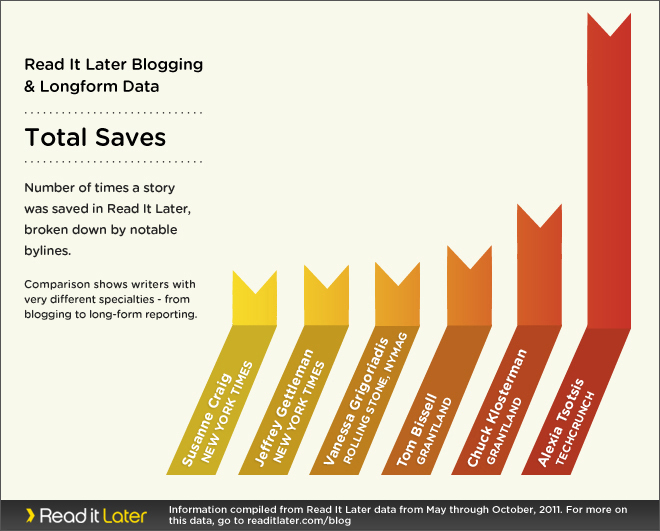 Today’s data source: 100 million articles saved by Read It Later users across all major web and mobile platforms. 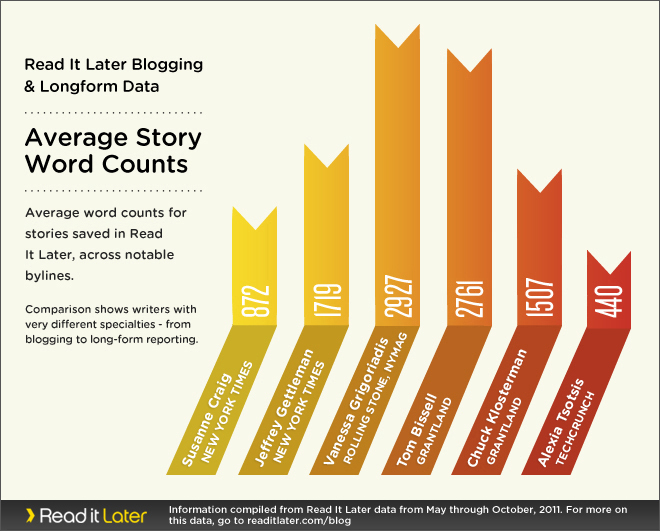 This chart shows the number of articles saved to Read It Later each hour (adjusted for timezones). As you would suspect, it is steady throughout the day as we are bombarded with content every waking hour. So how are readers dealing with the deluge of information? Readers are saving content for a better time. People are busy. It’s unrealistic that we are going to consume all of this content the exact moment we discover it. So we leave dozens of tabs open, we email ourselves links, or we use Read It Later to hold on to the content until we are ready to consume it. This graph shows the number of articles read each hour by Read It Later users on their computer. Compared to the times articles are saved, you can see that a significant amount of content was shifted towards the end of a user’s day (6PM – 9PM). The graph is not as flat either. Where the number of saves remains fairly constant between 8AM – 4PM, the number of reads grows more sharply until noon and then begins to fall off until after work. Overall though, this graph isn’t a dramatic departure from the times we are saving content. It seems that while on a computer, we are more susceptible to discovering additional content throughout the day. In reality, this really is a graph of whitespace time. Whitespace is the time between A and B. It’s the time on the subway or bus. It’s the time standing in line. It’s a spare moment. It is during these moments between tasks and locations that people reach for their phone. These are perfect times to knock an item or two off of your reading list. By saving content for later, readers are able to consume content during the voids in their day without interrupting the day’s normal flow. The graph of when users are reading on the iPad shows the biggest time for reading: personal prime time. This is generally the most relaxing time of day. After a long day, work is done, dinner is resting in your belly and there is nothing left to do but put your feet up and relax. This time slot is the same one coveted by television. When the majority of people are consuming content it seems perfectly natural that people would use this time to do their reading as well. Not surprising, if you look back at the graphs for computer and iPhone reading, you’ll see spikes during this same time (8 – 10 PM) appear on all graphs. While many have speculated that the iPad is going to replace printed newspaper and magazines, it is already changing the way we read online content too. The newspaper/magazine paradigm suits tablets extremely well. They are portable while still being large enough to make reading enjoyable. As I started by saying, the newspaper’s portability allowed us to read in the places we found comfortable. More importantly, it let us read the day’s content on our own schedule. The iPad is doing the same. Aside from a quick lunch hour at their desk, iPad owners are no longer doing the majority of their reading on their computers. They are saving it for their personal prime time, when they can relax comfortably, iPad in hand and burn through the content they found during the day. When a reader is given a choice about how to consume their content, a major shift in behavior occurs. They no longer consume the majority of their content during the day, on their computer. Instead they shift that content to prime time and onto a device better suited for consumption. Initially, it appears that the devices users prefer for reading are mobile devices, most notably the iPad. It’s the iPad leading the jailbreak from consuming content in our desk chairs. As better mobile experiences become more accessible to more readers, this movement will continue to grow. Readers want to consume content in a comfortable place, on their own time and mobile devices are making it possible for readers to take control once more. Over the past 3 years, Read It Later has grown to be one of the world’s largest digital reading platforms. Users have saved over 100 million articles and spent a combined 2.5 million hours reading last year in the iPhone and iPad apps alone. This has created a pile of data. As I explored this data in an effort to better understand how users were using RIL, I discovered a lot of really interesting insights into how the web, mobile and content spaces are changing. Recent changes in these spaces are frequently dissected in the press, but often with little data. With access to such a tremendous dataset, I wanted to start providing that data and hopefully start answering the questions we all have. After a lot of digging, typing and regret over closing my eyes through a few math classes, I’d like to introduce the new Trends series. Today’s inaugural post is the one closest to Read It Later’s heart and attempts to answer the simple question: When are people reading? You can follow along to future posts by subscribing or following @ReadItLater on Twitter. It’s Earth Day—marvel, reflect, and get inspired by the brilliance of bees.